Over the last twelve months there has been a huge increase in the number of customers subscribing to the TelstraClear InHome broadband service. Unfortunatey this growth is currently resulting in speeds for some customers on our 10Mbps plans being less than expected, particularly at peak times. We are working on installing new equipment to address the current situation but this will not be resolved in full until early next year. To make up for this situation we have decided to automatically credit your account with $10 each month until the new equipment is installed. This credit will take place from your next billing cycle. Throughout this period you will to continute to get the same amount of usage included with your plan and your email will be unaffected. Not bad I guess, hope we get something like that. But also, would really love the Internet to just work when you want it to! 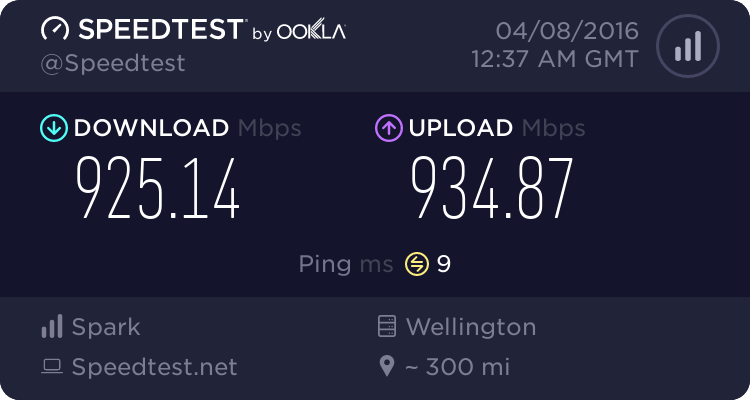 I'm personally not noticing huge speed issues in the evening performing speed tests (even in the evening). What I am noticing however is increased packet loss which is causing quality issues at times using my VoIP providers - VFX in NZ and Faktortel in Aussie. These issues didn't ever occur before so are obviously a result of their overloaded CMTS's. Does anyone know if all 10Mbps customers will get the credit? Or do we have to call in to state we are experiencing problems? googdot: Does anyone know if all 10Mbps customers will get the credit? Or do we have to call in to state we are experiencing problems? Not sure, I think the main aim is to continue to complain about the bad service, ring up during the day as calling the helpdesk in the evening is a waste of time, then ask to be put through to the complaints department, leave a message and wait a few days to get called back. My internet has slightly improved over the last week, however if I have to reboot the Cable modem it still can take up to 3-4 hours to come back online. The significant issues are only affecting some nodes. As CMTS's handle multiple nodes only some are being overloaded while others are coping fine. I'm not experiencing any issues at home other than at peak times in the evening, but if you're on an overloaded node or CMTS you're suffering from major issues and huge time frames for reconnection. If I was suffering those sorts of issues I'd be wanting more than $10 compensation.. I got my letter today and its for $20 per month untill the issue is resolved! Maybe its more because I am on the 40GB plan?? Anyway - Thanks TCL, great work! I think other telco's could learn from this example. Mine is $20/month as well. Just got my letter too - $20 per month. I'm on the 40GB plan. sbiddle: ...but if you're on an overloaded node or CMTS you're suffering from major issues and huge time frames for reconnection. If I was suffering those sorts of issues I'd be wanting more than $10 compensation.. I have suffered such problems and now, two months later, they seem to be finally fixed. But because you're 10Mbps customers you get refunds - what about the rest of us on 4Mbit? Is the refund only a recognition that you guys can't achieve full speed, but that's worse than 'no speed' for large chunks of the day like me because you're disconnected? I sent TelstraClear a letter to complain over two weeks ago now and still have no reply, no response and certainly no refund! It's really very irritating. We have been having this problem for a good 2 years, 11 am every Monday without fail the modem loses connnection and every day between 3:30 and 4:00 pm we lose a significant amount of speed. Occasionally we both give up working for the day as the connection is intermittent and mediocre at best. Admittedly it has been better recently but it is still an ongoing issue. BTW we got a letter for $20 credit. Have you removed the power from your cable modem, waited a bit, then re-applied the power? There was work done yesterday (Wednesday) from 12am to 6am which may have affected your cable modem. I had to get up a couple of times this morning at 4 am to power cycle my cable modem so that I could regain connectivity.